For the last 10 years, internationally acclaimed Australian painter Johnny Romeo has been one of the most exciting and dynamic voices in the contemporary world of Pop Art. Romeo’s latest book, Plastic Fantastic: A Survey Of Paintings, 2007 – 2017 takes a look back at the artist’s illustrious career over the last decade, charting Romeo’s trajectory from rambunctious punk-pop misfit to the Neo-Expressionist Pop juggernaut he is today. Over the course of 150 pages, Plastic Fantastic showcases some of Johnny Romeo’s most iconic works to date. 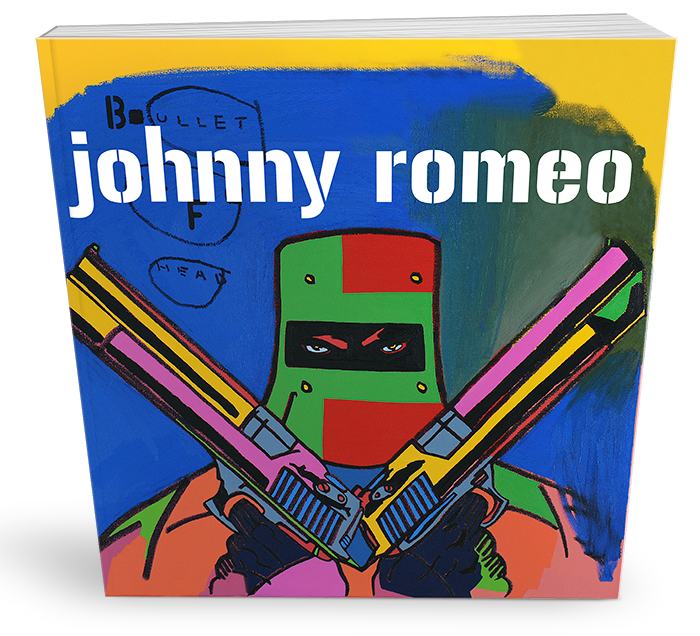 The book captures Romeo’s electrifying fusion of Technicolour explosions, comic book aesthetics and street art edginess in all its glory, highlighting his penchant for appropriating familiar Pop iconography and transforming it into thrillingly original paintings. Plastic Fantastic cheekily takes its title from Andy Warhol’s road-trip from New York to LA in 1963. Much like Warhol’s hedonistic jaunt through the seedy backwaters and wide-open plains of the United States, Plastic Fantastic is an adrenaline-soaked journey through the pure Pop psyche of Johnny Romeo. From his earliest works in Live At the Apollo to the glitzy Neo-Expressionist bombast of series such as Top of the Pops, the book reveals Johnny Romeo as one of the most vital forces pushing the Pop medium into new and exciting terrain today. Ambitious in scope and presentation, Plastic Fantastic is slated to be a full-colour, hardcover book release featuring essays from esteemed art critics. The book is a bombastic celebration of a truly stellar Pop visionary leading the global charge in Neo-Expressionist Pop art.